"Custom Mother's Charm Necklace Silver, Initial Droplet with Birthstone for One Child"
This unique mother's birthstone necklace is a precious way to show off who is special to you. 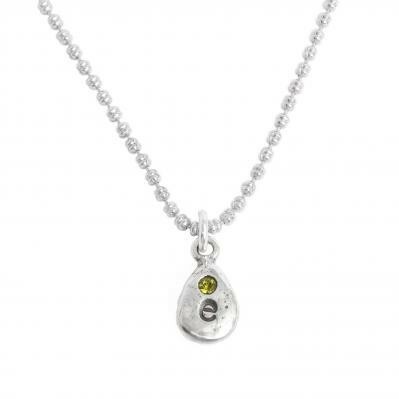 The sterling birthstone drop will be personalized with an initial and birthstone you choose. The mother of one will love this birthstone initial necklace. Small, simple and sweet ~ what every girl needs to bring a smile to your heart every time you wear it! The price listed includes the sterling silver Ocho Chain and one initial droplette charm. Use the drop downs below to select the length of your necklace. Go simple with just the single charm representing your little one. Or add more charms for you and your significant other. The listed price is for a 16" sterling chain and one custom droplet charm. If you would like more charms the price will increase. Use the drop downs below to select the length of your necklace and the amount of charms. We only use sterling silver, 14K gold, gold vermeil, gold filled, and bronze in our products.